DAPL Ruling: What Was Decided, What’s Next? 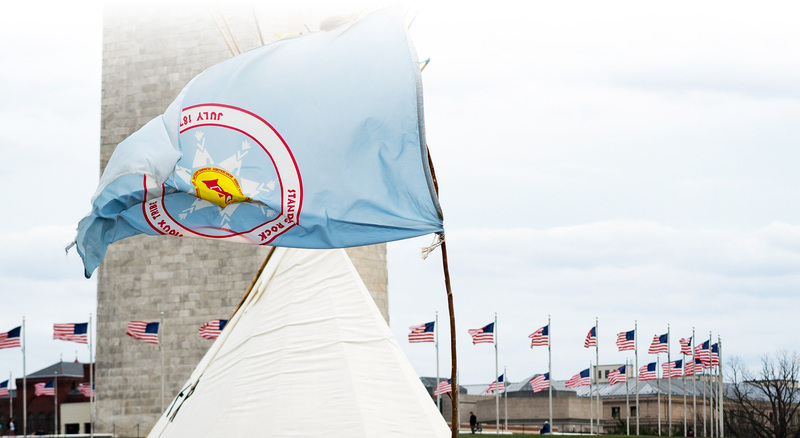 The Native Nations Rise gathering in Washington, D.C., March 7, 2017. Update, 6/21: The U.S. District Court for the District of Columbia held a hearing to set a briefing schedule for the continuation of the lawsuit, including a timeline for arguing whether the pipeline must be shut down while the Corps attempts to comply with the Judge’s orders. Attorney Jan Hasselman gave an update on Facebook Live following the hearing. Jan Hasselman represents the Standing Rock Sioux Tribe in their lawsuit against the Army Corps. He is a staff attorney at Earthjustice. The court decision finding legal flaws in the Army Corps’ permitting process for the Dakota Access pipeline was rightly hailed as a major victory for the Standing Rock Sioux Tribe and its allies, and a vindication of the concerns the pipeline has raised from the very beginning. It is not, however, the last word on the pipeline’s legality or operations, and we continue to face significant headwinds under this administration. On Wednesday, June 21st, the United States District Court for the District of Columbia will hold a status hearing on this case to determine how it will proceed, including next steps to the judge’s decision on whether the pipeline will be switched off while the Corps complies with the Court’s opinion. The Army Corps’ permits were legal in some respects and illegal in others. The illegalities stem from the National Environmental Policy Act (NEPA), which is a law that requires federal agencies to prepare full environmental impact statements (EIS) for federal projects that have significant environmental impacts. The core of the Tribe’s lawsuit was that the pipeline’s crossing at Lake Oahe on the Missouri River was significant enough to require an EIS. The Trump administration disagrees. It reversed the Obama administration’s decision in December to prepare an EIS, dismissing the risks of an oil spill and the consequences that could have for the Tribe and its rights. The Court found that the Trump administration decision fell short in three important respects, all of them fundamental to the Tribe’s concerns. First, it held that the Corps failed to address—or even mention—significant expert criticism of the agency’s oil spill risk review, which found that the Corps’ risk analysis was inadequate in several respects. Second, the Court found that the Corps never adequately considered the impacts of an oil spill on the Tribe's treaty rights, which includes protecting the Tribe’s right to hunt and fish on tribal lands. Finally, the Court found that the Corps’ environmental justice analysis was unlawful because it adopted a half mile buffer to assess oil spill risks, when studies have shown that, on a river like the Missouri, oil spills could reach far beyond a half mile. Only considering environmental justice implications within half a mile—when the Standing Rock reservation lies 0.55 of a mile from the pipeline—was not reasonable in the Court’s view. The Court upheld other parts of the Corps’ analysis. For example, the Court found that the Corps did not run afoul of the Tribe’s treaties when it issued its decision. There are two big questions ahead. One, the Court has returned the permits to the Corps for further review. It did not explicitly direct the Corps to perform an EIS, which means that the agency could simply revise or update its environmental review and again conclude that no EIS is required. If that happens, additional legal challenges are likely. The Tribe believes this court decision should trigger a full EIS, including consideration of route alternatives, just as the Obama administration proposed in December. We invite our supporters to share their views with the Army Corps and the White House that this is the proper path forward. Two, the Court has left open the question of the pipeline’s fate while this review process goes forward. Normally, when a permit is issued in violation of NEPA, the appropriate remedy is to “vacate” that permit—i.e., make it invalid in the eyes of the law. That would have the effect of forcing the pipeline company to shut down the pipeline while the review is conducted. However, the Court acknowledged that sometimes permits can be left in place during this period—meaning the pipeline could continue to operate while the review was underway. The Tribe’s position is clear. Until there has been a thorough analysis of the risks and consequences of operating this pipeline—one that actually meets the standards imposed by the law—the pipeline should not be operating. We will make that case as forcefully as we can to the Court, and we expect a decision in the next month or two. In the meantime, it is important to understand that NEPA, at the end of the day, does not require the government to make the most environmentally-protective decision. It prohibits uninformed decision-making but doesn’t prohibit actions that carry risk. Ultimately, our collective challenge is to persuade this administration that the pipeline doesn’t belong near the Standing Rock Reservation. Convincing the last administration of this was an uphill struggle, and it will be an even steeper hill to climb under this administration. But the Tribe is not backing down from this fight. We will continue to push for the pipeline to be shut down, a full and fair environmental review, and a new permit decision that respects the Tribe and its treaty rights, and prohibits the pipeline company from putting all of the risk of this dirty and dangerous project on Native people. 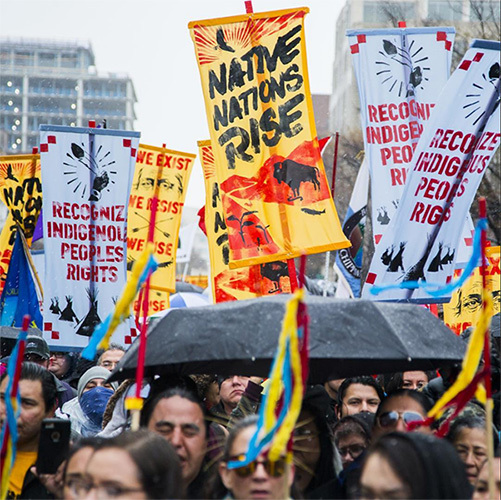 The Native Nations Rise march in Washington, D.C., March 7, 2017.